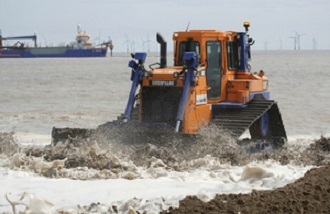 Around 400,000 cubic metres of sand are set to be pumped onto Lincolnshire’s beaches to reduce flood risk to more than 20,000 homes and businesses, 24,500 static caravans and 35,000 hectares of land in a massive Environment Agency-led project. The work forms a key part of the Environment Agency’s management strategy for the Lincolnshire coast, which reduces coastal flood risk to thousands of homes, businesses and static caravans as well as agricultural land. The project started at Boygrift, and over the course of the next eight weeks, the dredger will move to Trusthorpe, Mablethorpe, Ingoldmells, Trunch Lane, Wolla Bank, Chapel Six Marshes and Huttoft to complete the project for this year. The HAM316 dredger, which has the lowest carbon footprint of its class, is operating continuously, delivering approximately 5,000 cubic metres of sand twice a day. Mark Robinson, Senior Coastal Advisor at the Environment Agency, said: “Our work to restore beach levels is important as it protects our coastal defences, such as sea walls, from the energy of the waves as they impact on the coast. “Our defences along the Lincolnshire coast help us reduce coastal flood risks to tens of thousands of homes and businesses as well as significant areas of agricultural land. by replenishing beaches, we extend the defences’ life.